michellephilippi.com» Blog Archive » My Sunshine. Posted by Michelle on October 11th, 2013 . Filed under: BasicGrey, Cards, Published Work . It’s actually going to be my Friday for a while. I was off yesterday and I don’t go back to work until a week from Monday. The kids were off yesterday and today so we’ve been working on our fall bucket list, and today we’ll do lunch at Costco (pizza and soda $2 for each of us), and then I have a gift card at the frozen yogurt place, do some couponing, and go to JC Penney where I have a $10 reward to spend – I’ll let the kids each get something off the clearance rack for $5 a piece. 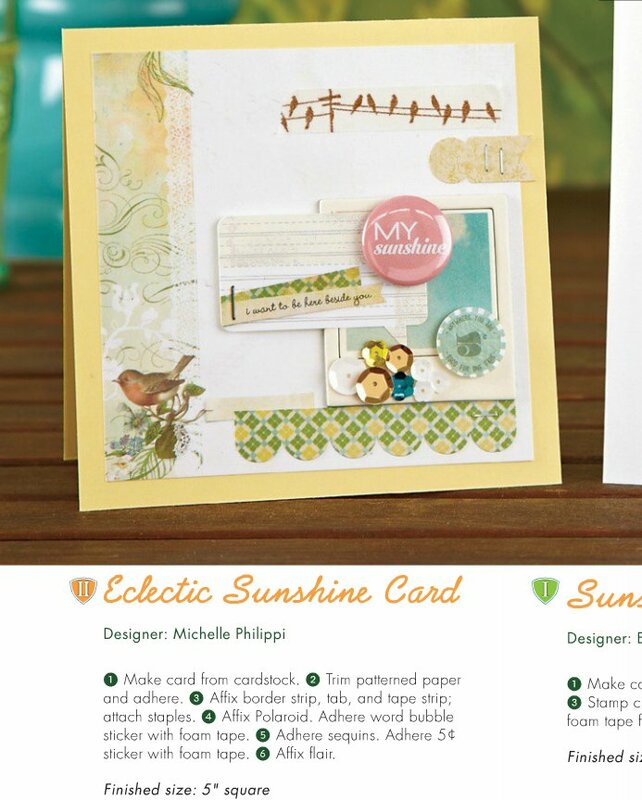 Today I’m sharing a card that I had published in the July/August issue of PaperCrafts magazine. It’s a rare occasion that I get something picked up in to PaperCrafts as a lot of their cards tend to be clean and simple – in my opinion. Mine just don’t fit the mold. But this category was called “freestyle collage,” and my card fit the bill. « Little Bitty Fall Gift Sacks. 1 Response to My Sunshine. Happy Vacation Michelle!! I hope you all have a great day and weekend! Love the card! Bright and cheery! !